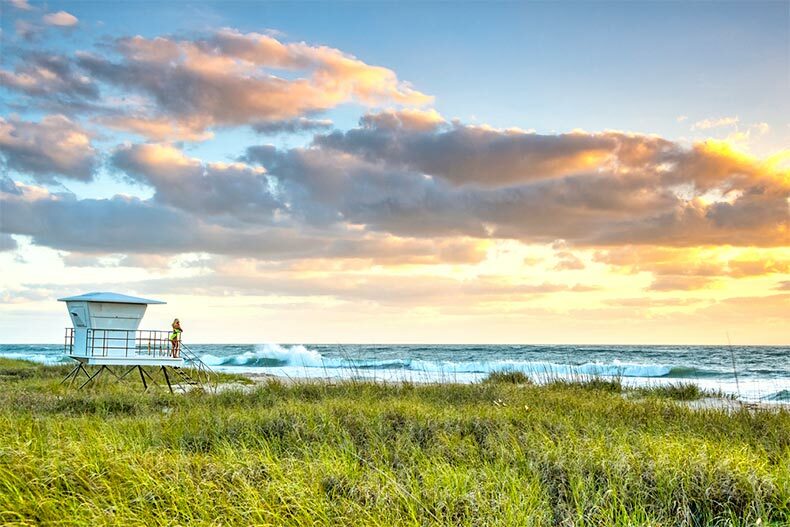 Florida's Treasure Coast provides affordable homes near beaches untouched by tourists. Active adults hoping to find a Florida retirement home that’s near the water but not outrageously expensive should consider the Treasure Coast. This area along the central shores of the state’s Atlantic side is historic, attractive, and largely untouched by a lot of tourist traffic and commercialism. These communities offer spacious layouts, quality amenities, and a price tag that’s less than $200,000. Low-maintenance condo living is available at Colonnades at Fort Pierce, a 55+ community that’s within walking distance to the beach. It’s also close to Fort Pierce Inlet State Park, a notable bird watching spot and a great place to fish. Colonnades at Fort Pierce is a collection of two-story condo buildings, and most units range in size from 600 to 1,300 square feet. You can stay on budget while living right on the water and enjoying views of Hutchinson Island. In addition to shuffleboard, tennis, and a pool, residents also have access to boat slips and a dock. There’s room to stow boats and RVs, as well as miles of natural trails to use for walking or biking. The non-age restricted community of Meadowood is still building, so you’ll have your choice of a new or resale home that’s below the $200,000 mark. Choose a condo or a single-family home, and enjoy access to the Meadowood Golf & Tennis Club. Membership includes an 18-hole golf course, practice greens, and a pro shop where lessons are available. There’s a fitness center, three outdoor pools, tennis courts, and bocce ball. Residents enjoy art classes and a computer club, and they’re also philanthropically minded, with fundraisers becoming a regular part of community life. Buyers can check out the condos, which have two or three bedrooms, or single-family homes built in a variety of sizes and layouts. In addition to offering affordable homes, there’s a reasonably priced homeowners' association fee which takes care of landscaping and security. Meadowood is close to Pepper Park, a beach that’s great for snorkeling and scuba diving. Beautiful homes and upscale amenities can be found at Kings Isle in Port St. Lucie, one of the most sought-after areas in the Treasure Coast. Courtyard homes are affordable and comfortable, with two bedrooms, two bathrooms, and over 1,000 square feet of living space. Single-family homes come in nine floor plans with two or three bedrooms. Residents in this gated 55+ community get together at The Royal Club, where there’s a fitness center, a ballroom, and a library. Shuffleboard and tennis courts are also available, and there’s even a horseshoe pit. Kings Isle has a bowling league, a Habitat for Humanity volunteer group, a book club, and many other classes and activities available. It’s close to the Florida Atlantic University’s Treasure Coast campus as well as several shops, restaurants, and golf courses. It’s all about lifestyle at Palm Grove in Fort Pierce, where 55+ residents get together for wine and cheese tastings, host Sunday Evening at the Movies, and relax together around the heated outdoor pool. There are holiday events, cookouts, and day trips that take interested neighbors on tours of some of the most fascinating areas in Florida. You’ll also find affordable living. Plenty of single-family homes can be purchased for less than $200,000. They have two or three bedrooms, two bathrooms, and are between 1,305 square feet and 2,766 square feet. Available homes for sale are spacious, comfortable, and outfitted with modern updates such as wood laminate floors and granite countertops. Just outside the community is a popular farmers market, and the area is home to plenty of championship golf courses. You’re also near the airport and major roads like Interstate 95 and the Florida Turnpike, making travel a cinch. Beautiful single-family homes can be found at or below the $200,000 level in the Lake Forest community, which does not have any age restrictions. Each home model is named after a bird, so buyers can decide if they want to live like a cardinal or a hawk. The community is close to championship golfing, and it’s also a stone’s throw from First Data Field, the spring training facility for the New York Mets. Residents enjoy strolling and biking around the scenic landscape of Lake Forest, where there are trails and paths as well as ponds where you might see a turtle or a wading bird looking for fish. There’s a strong community feel here, and neighbors get together for Easter Egg hunts, horseshoes, happy hour, water aerobics, and dinner parties. Bring your continental appetite because an international food club keeps things delicious.